Last November SAP unveiled the new HANA 2 - Next-generation platform for digital transformation. It offers new features and functions for database management, data management, analytical intelligence, and application development. SAP HANA 2 includes and extends the proven technology from SAP’s breakthrough in-memory computing platform to provide a new foundation for digital transformation. Do I have to upgrade HANA 1 to HANA 2? While an upgrade to HANA 2 is not mandatory at the moment, SAP mentioned that everyone should upgrade to HANA 2 soon as HANA 1 will only be supported until May 2019. SAP will not be releasing any new features on this platform (only bug fixes) until that time. 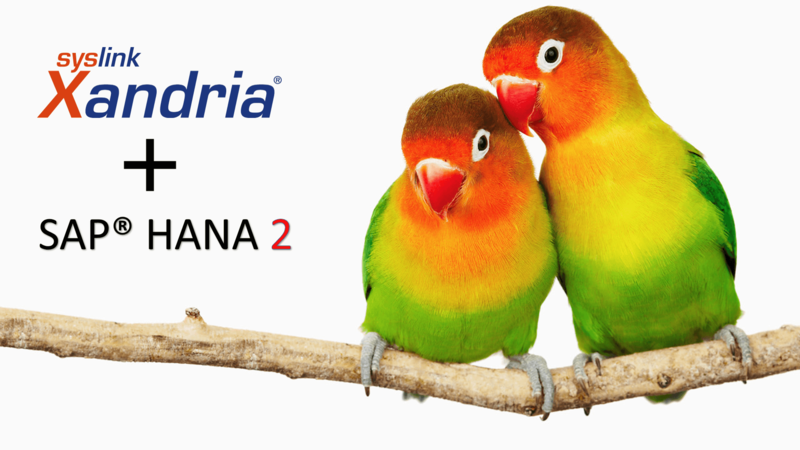 Do I need to upgrade my Xandria syslink server or agent to support HANA 2? We always recommend running the latest release of Xandria. Xandria version 5.2 that was launched in 2013 was the first in the world (other than SAP) to introduce HANA monitoring. We’ve since released many interesting features including predictive analysis to enhance it and add features like the support of HANA 2 announced here today. syslink Xandria monitors close to thousand HANA servers with tens of millions of checks performed daily. Can syslink Xandria help me with HANA 2 implementation, migration and upgrade? Absolutely! During and after the upgrade you want to make sure that nothing has been harmed and everything is working well. It is vital you have records of the performance of your systems prior and after migration. Understanding the performance of your source HANA system prior to migration will give you indications of any performance issues post migration. Xandria can help record these key performance indicators automatically, allowing you to focus your time on more important tasks and not manually recording performance times. Also, as with any migration process, monitoring often gets lost during the downtime phase. Businesses can only allow tight maintenance windows, which means the migration team needs to have good insight into the system health during upgrade to ensure it is processing the migration at the proper speeds. Xandria can monitor the database and migration log files to ensure no issues are occurring while all SAP application monitoring checks are disabled during SAP downtime. In addition to that, you want to ensure the down time will not be counted your committed SLA. Xandria allows you to schedule and plan ‘maintenance time’ which will be clearly reflected in the reports. What is new in HANA 2 compared to the current SAP HANA version (SPS12)? While you can find an extensive list of the new features that SAP presented in HANA 2 in this article, we’ve created a short list of highlights. Database management: multiple enhancements for high availability and security. For example, support for secondary systems instead of just system replication to allow offloading read-intensive loads resulting in improved operations and performance. Data management: The SAP HANA-based Web application SAP Enterprise Architecture Designer allows customers to visualize the impact of new technologies on their architecture before they are implemented. In addition, a tiered storage enhancement allows the distributed storage of data by priority regardless of where it resides. Analytical intelligence: SAP HANA 2 allows customers to integrate additional insight obtained by analyzing text, spatial, graph and streaming data into their applications. We will be happy to further discuss your unique environment. You can also join a 15-minute live demo.